The final whistle: A biography of Sir Bobby Robson – Part Two. | NUFC Blog. Bobby at Fulham in 1966, seeing off some fearsome oppostion! After six years of fine service to the Midlands club however, Bobby returned to Fulham in 1962, his departure caused by a wage dispute with the bigwigs of Albion. Bobby had just welcomed a second son into the world with Elsie, and financial security was very much at the forefront of Bobby’s mind. Though he loved playing at West Brom, these were the days when being a top class international footballer was little different from being a bus driver. Back in West London, his salary was immediatedly doubled, and Bobby could at last enjoy some form of financial security. This was largely due to his Fulham team-mate, Jimmy Hill and his great work as president of the PFA (Professional Footballer’s Association). In 1961, Hill managed to get the ‘maximum wage’ for footballers abolished. Just before it’s abolition, it stood at (eat your heart out, Christiano Ronaldo) £20 per week. Though far less ‘pacy’ with his advancing years, Bobby’s superb skill and technique were still there in his Fulham encore, so he played a further 192 games for Fulham over five years, eventually retreating into a more defensive role. However, time marches ever onward, especially in the world of the footballer, so he eventually had to make way for future great ‘Cottagers’ such as Rodney Marsh and Alan Mullery. So, in 1967, he left Fulham, eventually accepting what was supposed to be a three year deal with ‘Vancouver Royal Canadians’ or ‘Vancouver Royals’ as they were more commonly known. In his English career, he had played a total of 627 games, scoring 141 goals. Indeed, the early days of Bobby’s management career was far from plain sailng. After rejecting a coaching role at Arsenal, and another offer to be player-manager of Southend United, Bobby eventually joined the Royals in June 1967. Here, he entered the strange and new world of ‘soccer franchises’ over the pond, where teams could just ‘up sticks’ and move hundreds, even thousands of miles away. At that stage, the teams were mostly imported wholesale from England and the Royals were, in effect, Sunderland in a different strip! However, Bobby’s spell in Vancouver was to be shortlived. Shortly after Robson’s arrival, another team from the then ‘United Soccer Association’, the San Francisco ‘Golden Gate Gales’ folded and merged with the Royals. The leader of the San Francisco team was the legendary “Galloping Major” from Hungary, Ferenc Puskas. When the ‘Gales were effectively disbanded and moved up to Vancouver, it was Puskas who was chosen to lead the merged team, and Robson was offered the position of assistant coach instead, which he refused. So ended what has been referred to as “the job that never was”. In January 1968, barely seven months after his ill fated trip to Canada, Bobby started his first major position in management, returning yet again to his old alma mater. Fulham were, as usual, involved in their perennial struggle against relegation to the old second division when Robson took the helm, and he was unable to save them. However, his problems mounted when the club’s poor form continued in the next season, and he struggled to maintain his authority with players, many of whom he had played alongside in recent years. Coupled with an argument with one of the Fulham directors, this amounted to what could be described as a ‘perfect storm’, and Robson was sacked in November. He famously discovered that he was out of a job once again by reading it on a newspaper billboard. One highlight of his spell there however was his signing of a completely unknown left back from Totteridge. A player Bobby thought he could turn into a decent centre forward in the fullness of time. His name was Malcolm MacDonald and he later enjoyed great fame as a truly spectacular centre forward for Newcastle United, Arsenal and England, for whom he once scored five goals in one match. The statistic from his managerial spell at the Cottagers certainly doesn’t look very pretty. Under Robson, Fulham lost 21 games out of 36, drawing nine and winning only six games. 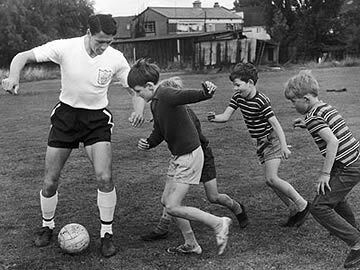 He was replaced by his old team-mate, the still playing Johnny Haynes. However this was to be a similarly brief appointment. Ipswich Town: The long march to glory. 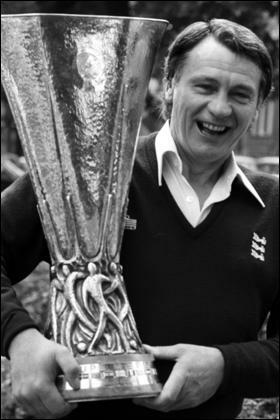 Bobby with the UEFA cup in 1981. At the time, few would have guessed what was to come next when, after these early knocks, he joined Ipswich Town in 1969. Slowly but surely, the great manager emerged like a butterfly from a chrysalis as he patiently and gradually transformed the ‘Tractor Boys’ from a small Suffolk club into a genuine domestic and European force. Robson also built a reputation for himself that is in some ways remiscent of Arsene Wenger’s today, with an emphasis on beating the big boys through developing young talent in a very strong academy system, and also not being afraid to bring in players from overseas, something that was very rare in those days. However his start was inauspicious, and Ipswich were to struggle in the lower reaches of the old First Division for a few years yet, and some Ipswich fans even called for him to be sacked again. There were also confrontations with the players too, and Bobby once recalled a situation where he almost had a fight with some of the Ipswich old guard. Thankfully though, Bobby had a very good relationship with the owners of Ipswich, the Cobbold family, who had the wisdom and the foresight to ignore the short sighted fans and truculent players, so they persevered with their young manager. Things finally started to change when Robson won his first cup, the Texaco Trophy, in 1973 and Ipswich finally started to move toward the top end of the First Division after four years with Robson at the helm. After more steady progression, Bobby’s, and Ipwich’s dreams were finally made reality, when they won the FA Cup in 1978, and after several years of qualification for european competition, the UEFA Cup in 1981. “The great thing was I had the chance to put my own ideas into practice – proper training schedules and so on. In fact I wasn’t only the manager I was also my own coach – and I also put a lot of effort into the youth policy. “Nowadays we have these fancy names – centres of excellence, academies and so on – but youth policy is still what it’s really all about. Finding young players with raw talent and then trying to teach them to make the most of it. “I used my own ideas. We played with two strikers and little Eric Gates in the space just behind them. I always had a flat back four and John Wark in front as a defensive midfielder. Then I had Frans Thijssen and Arnold Muhren. I didn’t have wingers but Thijssen and Muhren were such outstanding player and covered so much ground we didn’t need them. “We were voted the best team in Europe, you know, in 1981. That was the year we won the UEFA Cup and we should have won the league as well. We had Paul Mariner and Alan Brazil up front and Gates just behind them and opponents were never sure how to cope with him. “Well, of course, we finished second in the league and we deserved to win it. We would have won it if we had another two players. But we didn’t have much money so I couldn’t go out and buy. It wasn’t like today with all these big squads. Eventually, after thirteen years of tranforming Ipswich, and the sacking of another of Robson’s ex Fulham team-mates, Ron Greenwood, he was selected in 1982 to be manager of the national squad over his brilliant but controversial colleague, Bryan Clough. One of his first acts was to install as head coach his ex teammate, and the man who persuaded him to attend that first coach’s meeting with Winterbottom, Don Howe.